This launcher is very useful for those users who don’t have costly Samsung high end devices like Samsung S4, Galaxy S3 etc. Those people’s easily install this look and feels on his Android mobile phone by this Samsung Galaxy S4 Touchwiz launcher. This launcher is one of the best looking user interface in all the Android Smartphone. Galaxy S4 Launcher is installed only on the Jelly Bean 4.1 and 4.2 devices. We try it on Canvas 2, Micromax A116 and Micromax A110Q. It working very nice and smoothly but i feel it’s consume much battery as compared with Android Stock ROM default launcher. 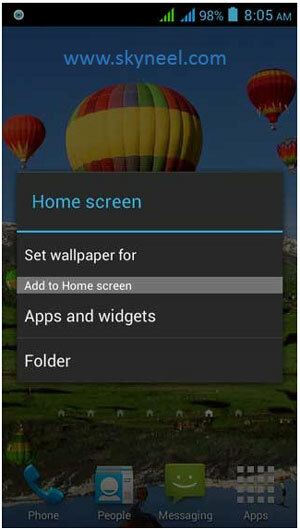 This launcher is completely feel Samsung S4 on your Android Phone. Step 1. Download this launcher and copy on your SD card >>> Switch off your phone >>> Now, press Power button with volume up and down key at the same time for few second you will get two options >>> Press volume up key and select recovery mode. Step 2. Now, tap on / select the install option and choose your Samsung Galaxy S4 Touchwiz launcher zip file from your saved location on your SD card >>> Click on install option, your installation process is started. Step 3. After complete the installation, you must wipe your cache and dalvik cache >>> Now, reboot your phone. After start your phone choose Samsung S4 touchwiz Launcher by tap on home key and you will get a popup tab then you tap on “as always”. We didn’t find any bugs in this launcher. So install and enjoy Samsung Galaxy S4 Launcher touchwiz. I hope you like this article very much, please share this article with your friends, colleague, and others and show you have better knowledge in the mobile sector. Thanks to PritzAnkY™ and Linq’z Qirls’z for this S4 Launcher. THIS launcher consumes more battery…it reduces ur battery upto 30%. which is Rom you install? After installing this launcher, will it effect on battery backup on canvas hd?????? Abhishek… It Doesnt Work In ICS! NOTE: The Only BUG is… Widgets Don't Work For This App! Samsung Galaxy S4 touch wiz Launcher.zip is root required. i am testing it. It dose not have any bugs, all Widgets work fine.